There may be a chance of some F2 propagation by next March, and I certainly am committed to spending an inordinate amount of time trying to work it! However, even if there is no F2, there are some good EME windows with everyone around the world (especially during the first few days of the trip) and I have the proven ability (E51SIX, 3D2GJ, 5W0GJ, E6M) to work single yagi stations on JT65A mode when the moon is near their horizon by using my portable 6m DXpedition station. 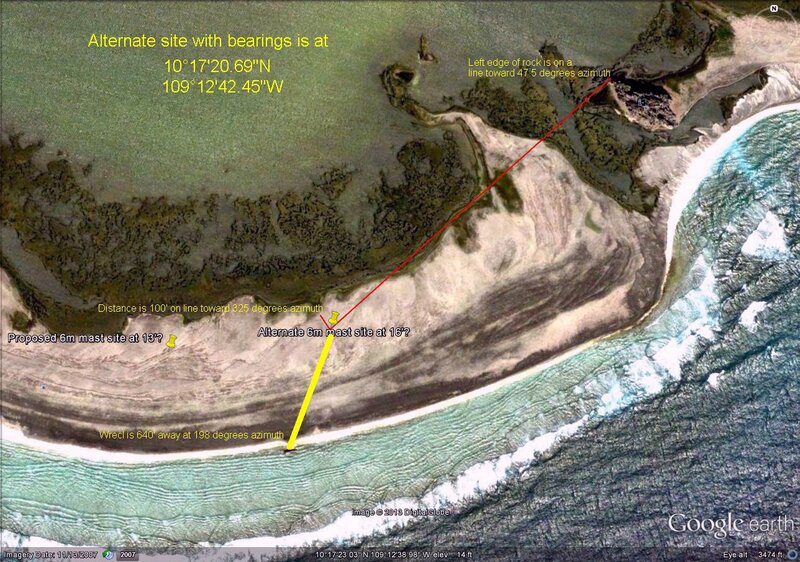 So anybody who is seriously interested in 6m should have a good opportunity to work Clipperton Island one way or another. 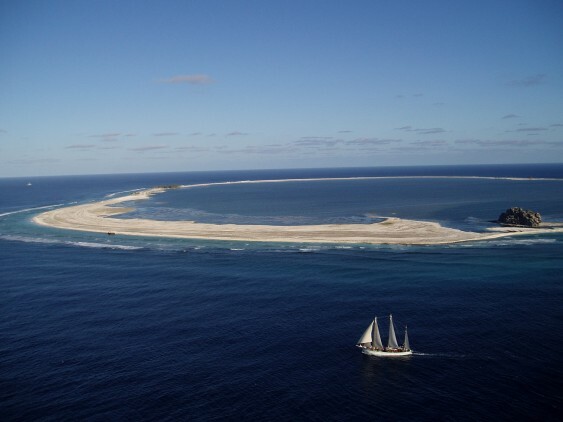 I have been assured that I will be able to operate 6m full time, so am very hopeful that many people will be able to add Clipperton to their 6m DXCC totals. The 6m station is essentially the same as that used on my other 6m EME DXpeditions, except that I am also taking a paddle for CW, and I also will use the computer keyboard for sending and logging CW. The 6M-1000 has been modified by M2 for overseas use, and provides a solid KW output on JT65A mode with under 3 watts of drive. The transceiver this time will still be the reliable K3 and PR6 preamp. The K3's flat, wide bandwidth is ideally suited to copying multiple JT65A mode callers spread out every 200 Hz from about -800 Hz to +800 Hz. The antenna again is my 6M8GJ yagi fed with LMR600 low loss cable and home-made manual elevation mount. I also have purchased a Honda EB3000c 125 VAC 3kw generator for operating 6m at TX5K (and built a shipping crate for it), and a MeanWell RSP-2000-48 power supply that runs off 120 VAC so I can use it with the generator to power the 6M-1000. Thanks to the generous support of RF CONCEPTS, I also will be using an ALPHA 8406 as the primary amplifier. Although limited by my 125 VAC generator, tests here have demonstrated that it is capable of a solid kw output on JT65A mode (and more on SSB and CW). If anything, this configuration will give me a bit more output than on my previous 6m DXpeditions. As you can see from reviewing the trip reports from my previous 6m EME operations from E51SIX, 3D2LR, 5W0GJ and E6M, many contacts were made with single yagi horizon-only stations. The smallest station contacted from all four of those places was N3CXV with his single 6M5X yagi. If you have a good yagi, good ground gain, good power and lots of patience, we should be able to complete via EME, although the Degradation will be higher at the time of the Clipperton operation. If there is ionospheric propagation, the EME station should be very effective on F2! The actual 6m operating site will probably not be finalized until landing, although the most southern tip is my first choice for the 6m station location, with the most northern tip being my other choice. 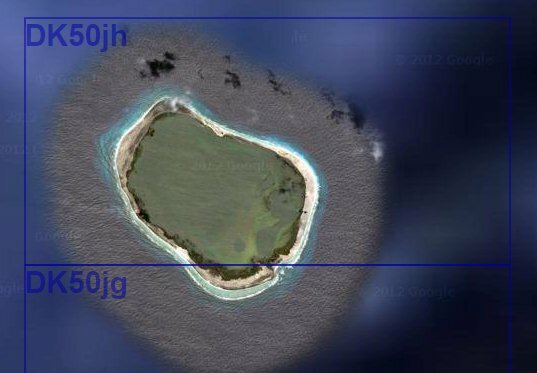 Note that the entire island is in main Maidenhead grid locator DK50, and most of the atoll is in subgrid DK50jh; only the southernmost tip of the island is in DK50jg. So, as far as WSJT modes are concerned, either grid locator will adequately work with callsign TX5K. 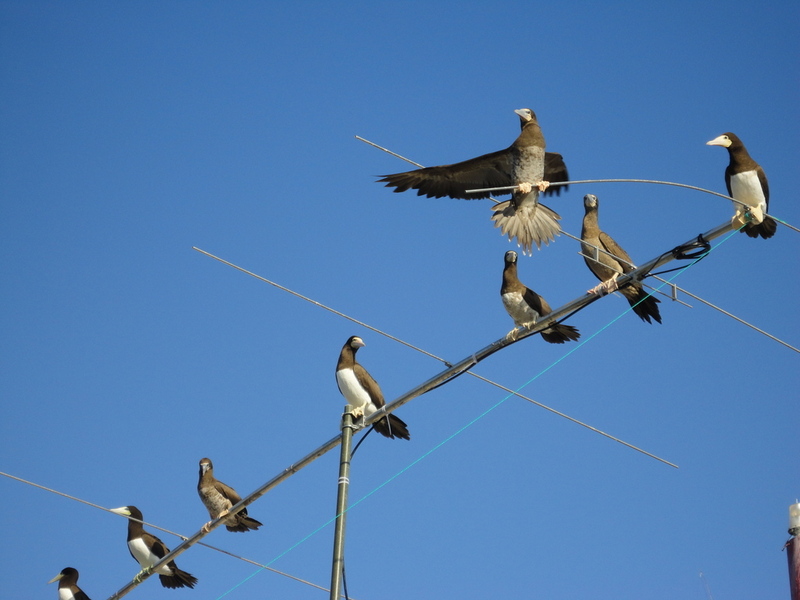 When making 6m contacts on ionospheric propagation, please do not waste time exchanging grid locators with us. You just learned that we will be in DK50, and we will not be logging your grid and don't care what it is. I am only interested in making a simple technical contact with you on 6m ;-) Also, whether via ionospheric or EME propagation, please do not call after you have already made a good contact - in other words - NO DUPES PLEASE! Let's try to let as many people as possible get a first contact with this rare DXCC now during these very challenging propagation conditions. As you can see from the above map, there will be very little need to aim between 150 and 220 degrees azimuth. There also is a "dead zone" between 310 degrees (toward JA) and 340 degrees (toward W6). Therefore, ideally, efforts will be made to locate the station so that the generator and operating tent are at an azimuth of 325 degrees from the antenna, while still affording shots over the ocean on moonset and moonrise. 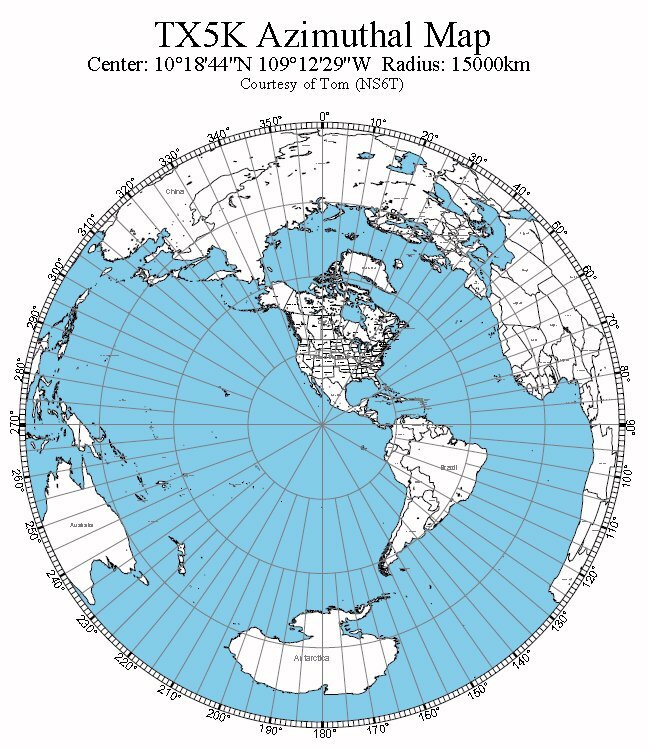 The location shown here affords the highest ground, along with a clear shot toward USA from Florida on around through north. A tentative 6m Operating Schedule in UTC is shown below. However, I am anticipating very difficult operating conditions, and the schedule is subject to weather, landing and unloading delays. So there may be periods when I am unable to follow the schedule exactly as planned. I also have to sleep sometime and/or go off to get food/water/fuel, so please be patient with me! I am hoping to set up by myself far from the HF operations in order to achieve a low receiver noise floor. I will be trying to dodge crabs and rats during all the moonrise periods when I am out trying to adjust the antenna but fortunately, JT65A will continue to operate while I am outside moving the lines on the antenna to aim it. Please be patient with me if we have to frequently disconnect and go off the air....there are plenty of tropical storms down there, and my antenna (and even my backpacking tent) will be the highest thing for 1/2 mile. Anticipated EME operations during my MOONRISE and MOONSET are shown. Times shown during MOONRISE periods start with my moonrise and end with moonset in Europe. Times shown during MOONSET periods start with the moon at 20 degrees elevation in New England, and end with my actual moonset at TX5K (which is also often very similar to moonset along the west coast of North America). Note that the last moonset is also during sunset, so there may be solar noise and/or ionospheric propagation during that period (although I have very successfully operated 6m EME during such times in the past anyway). If you wish to contact me by 6m EME and you don't see that I have shown an EME operating time that works for you, please let me know - I will do my best to accommodate everyone's needs to the best of my ability. NOTE: If you are in North America and have the choice to contact me on either your moonrise or moonset, please consider your moonset first (unless you are in western USA and your moonrise is after the EU moonset). It is true that my moonrise windows will be in total darkness, and will undoubtedly be free from any interference from ionospheric activity. However, notice that my MOONRISE periods will probably be very busy with EU callers. There will be no windows with EU on their moonrise, so I will normally give priority to any EU stations I decode (at least if they are copying me). Expected EME operation will take place on 50.190 and TX5K will always TX FIRST sequence JT65A mode. Anyone seriously interested in completing via EME is encouraged to call during the first few days of operation, as the Degradation becomes excessive during the middle of the trip. EME operation during the times shown during the first half of the trip will take priority, because these times are the only windows with eastern Europe, and little chance of ionospheric propagation is anticipated then. The EME operation shown during the latter days of the trip is contingent on there not being any ionospheric propagation at those times, which will take priortiy on those days. Continued EME operation during the second half of the trip also will be contingent on the amount of activity - especially after European moonset. Similarly, the amount of EME operation between the EU moonset and the beginning of NA moonset (times shown with an asterisk *) will be contingent on the amount of continued EME activity seen during those periods. Especially after March 6, if you hear me calling CQ on JT65A via some ionospheric mode, please call me on JT65A or try to answer me on some other mode. Anticipated ionospheric operation (and beaconing) is planned to take place on 50.117. Beacon operation in most cases will be an attended "breakable beacon" so please make noise on whatever mode you have available to "break" it. I suspect it may be necessary to lower the power during beacon operation in order to save on generator fuel. Therefore, signals may not be strong enough for you to hear. Please use an aid such as Spectran or SpecJT (the waterfall display in WSJT) to LOOK for weak JT65A or CW signals that can be 10 to 15 dB too weak to actually hear. When the beacon is not running and I also am not transmitting somewhere, I will be monitoring 50.110 for signs of activity. I urge you to gain experience with JT65A and especially review the QSO PROCEDURE that I use most effectively on these DXpeditions I look forward to contacting you on 6m EME. which very well may be the ONLY way that many stations outside the TEP Zone will be able to contact TX5K on 6m, given the low solar flux! Please use the ON4KST EME CHAT PAGE page to coordinate your transmit frequency with other callers, so you do not create QRM with another caller - ideally, stations should be spread out every 200 Hz. Please also keep calling me even if you copy me working someone else. As long as you are not on the same frequency as the other station, you will not be interfering with them. I try to decode all callers every receive sequence, and I make a note of each caller and their and frequency so I can reply to you as soon as I am able. Therefore, NEVER change your transmit frequency after you start calling - pick a clear frequency nobody else is using and stay on it! I will try to contact any callers I can copy, but first priority will be given to contributors and stations with shorter common moon windows. TX5K is a standard type of callsign, so no "special prefix" has to be added in the WSJT SETUP/OPTIONS screen. However, you may want to add TX5K in grid DK50jh to your call3.txt file if you plan to use the Deep Search option and/or have my moon position shown when you click on the tab to "VIEW/ASTRONOMICAL DATA".. You do this from the main JT65 screen. If you have any question on how to do this, please either contact me, or ask any experienced 6m EME operator on the ON4KST EME CHAT PAGE. I will also attempt to be monitoring the DX Cluster to watch for 6m spots of the TX5K beacon and/or other 6m contacts (see below). The plan is to use Wintest for logging all 6m ionospheric contacts, whether CW, SSB or digital. EME contacts will be made by paper log (as always), and such completed contacts will be added manually to the Wintest log after the fact. The log will be transferred periodically to the main computer station for inclusion in the overall TX5K log and uploading to the on-line search. It may or may not be possible for the 6m station to be connected to the real-time network with the rest of the HF stations, which can upload contacts almost instantaneously. It is not anticipated that I will have any email access from TX5K. However, I do anticipate that I will be in contact with the HF station via a 2m HT, so if there is a particular message being relayed via HF, I am hopeful that the message could be passed on to me. It is also possible that I may be on the main TX5K network, in which case I would be able to at least VIEW the DX CLUSTER spots, and see where the 6m propagation is at a particular time. It also MAY even be possible to me to access the ON4KST REGION 2 and ON4KST EME chat pages via the TELNET client KNT2ME. I have loaded it on my laptop and am hopeful that I will be able to gain access to the network and that the network will support such communications when it finally is set up. As of the third week in January, all 5 boxes of my equipment and tent, plus the two boxes for the Alpha 8406 and its transformer, plus my generator, have all been received down in California for transfer to the Shogun. Feb 14.2013 - Equipment is being loaded onto the Shogun at the port in San Diego, California.